The lost world of the 1930s circled by two men in one small car. By Max Reisch & Peter H Reisch. Translated by Alison Falls To fully appreciate why this book makes such a memorable read, it’s best to understand the background to the Austrian adventurer Max Reisch (1912-1985). His first epic journey took him from Vienna to Bombay on a 250cc Puch motorcycle with fellow student Herbert Tichy as pillion. Max was just 20 when they left Europe in 1933 and this journey was re-told in his first book India-The Shimmering Dream. Two years later a similar expedition was planned although this became something completely different by the time Max departed with 19 year old friend Helmuth Hahmann in 1935; it became their incredible journey. Automobile manufacturer Steyr-Daimler-Puch not only backed the project, they also supplied the star of this story as another two wheel project was abandoned in favour of the all-new Steyr 100 car. 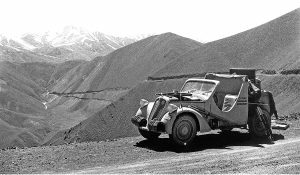 With few modifications and just 32hp of performance from 1385cc, the Steyr was initially set the challenge of travelling overland from India to China; a treacherous and rarely navigated route in 1935. The book quickly gets into the adventure with the team shipped to Haifa and Palestine, following the oil pipelines into Iraq and Iran at a time in history that brings thoughts of Indiana Jones movies to the reader. 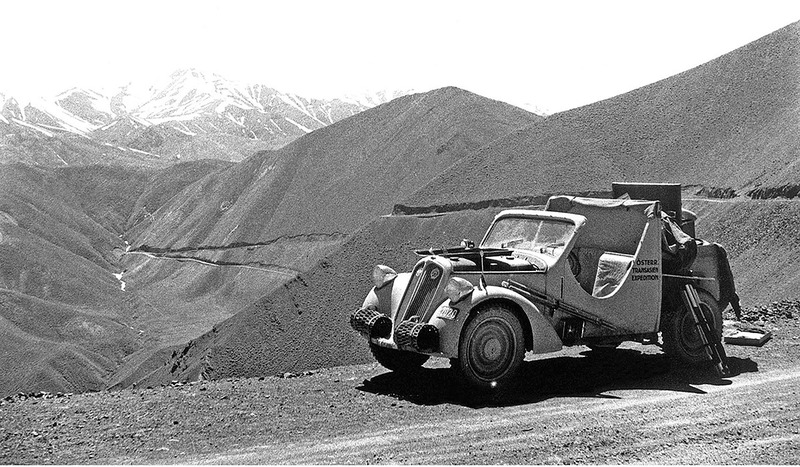 The harsh deserts are followed by the rugged terrain of Afghanistan; all the while superb in-period images accompany the fast moving miles as the little Steyr proves its endurance qualities along with its pilots. Prior to the construction of the Burma Road much sub-continent travel would include mud laden forest tracks or river crossings on home built barges. Without giving too much detail away, the scale of this journey takes in the vast distances from the Mediterranean, across Persia and through India down to Rangoon before heading east to Hanoi, tackling jungles and mountain passes onto Shanghai and the Pacific. After 23,200klms covered across Asia was it job completed? Certainly not, as the trio continued via ship to Nagasaki before crossing Japan to Tokyo where a Seattle bound cruise liner transported them to the USA. Down the west coast highways before taking in Mexico and the final part of this amazing 19 month circling of the globe. West to east ‘Stateside’ finishing at New York prior to an Atlantic crossing ultimately returning to dry land at the port of Bremen. Max Reisch story telling is detailed and his style is an easy read, conversational and witty, aided no doubt with brilliant translation by Alison Falls. She brings the German text to an English audience, ensuring it remained free-flowing and exciting. This journey certainly was incredible and totally absorbing 80 years on; fully capturing the essence of adventure with pre-war cultures (many of which have disappeared) all enjoyed from the seat of a small Austrian motor car. A real ‘Boys Own’ adventure featuring two young men who took a camera and drove around the world. 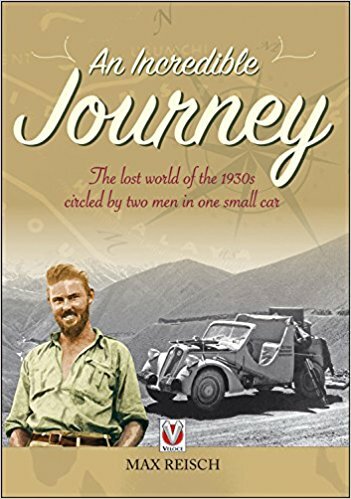 The lost world of the 1930s circled by two men in one small car.